The First Time I Heard Cocteau Twins is Part II in an ongoing series where musicians and writers tell their stories of first hearing the music of an iconic artist or band. 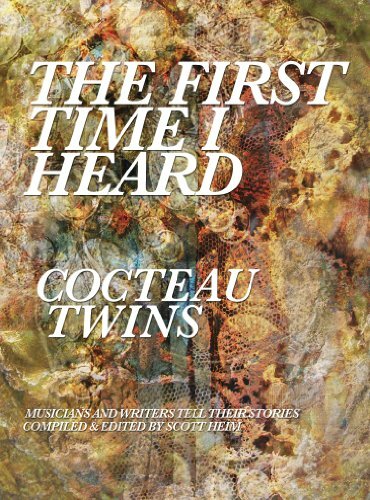 In this second volume (following the opening installment, which covered Joy Division / New Order), forty different musicians and writers remember their initial experiences hearing the seminal dream pop/post-punk band Cocteau Twins, an early standout group from the legendary 4AD Records and favorite of radio personality John Peel. The Cocteau Twins hailed from Grangemouth, Scotland, and featured musicians Elizabeth Fraser, Robin Guthrie, and Simon Raymonde. Contributors to the Cocteau Twins edition include musicians such as David Narcizo (Throwing Muses); Ian Masters (Pale Saints); pianist and Cocteau Twins collaborator Harold Budd; band collaborator and live guitarist Lincoln Fong; Pete Fijalkowski (Adorable); Anka Wolbert (Clan of Xymox); Sean "Grasshopper" Mackowiak (Mercury Rev); Meredith Meyer; Mark Van Hoen (Locust, Seefeel); Paul Anderson (Tram); Paul Elam (Fieldhead); Rebecca Coseboom (Halou, Stripmall Architecture); Michael Cottone (The Green Kingdom); Sarah Jaffe; Antony Ryan (Isan); Dean Garcia (Curve); Kurt Feldman (The Pains of Being Pure at Heart); Erik Blood; Annie Barker; John Loring (Fleeting Joys); Guy Fixsen (Laika and co-engineer for My Bloody Valentine); Emily Elhaj (Implodes); Carlo Van Putten (The Convent, White Rose Transmission); Eric Quach (thisquietarmy); Ryan Policky (A Shoreline Dream); Matthew Kelly (The Autumns); Steve Elkins (The Autumns); Ryan Lum (Lovespirals); Michael Savage (The Fauns); Amman Abbasi (The Abbasi Brothers); Eric Loveland Heath; Ben Mullins (Midwest Product); Keith Canisius; Michael McCabe and David Read (Coldharbourstores); and writers like Emily Franklin, Craig Laurance Gidney, Alistair McCartney; Tony Leuzzi; and Sommer Browning. The "First Time I Heard" book series is edited by novelist Scott Heim (Mysterious Skin, We Disappear) who is also a longtime music fan. Other installments in the series (or those forthcoming soon) include books on Joy Division / New Order, David Bowie, The Smiths, Kate Bush, R.E.M., Kraftwerk, My Bloody Valentine, Abba, Roxy Music, The Pixies, and others.